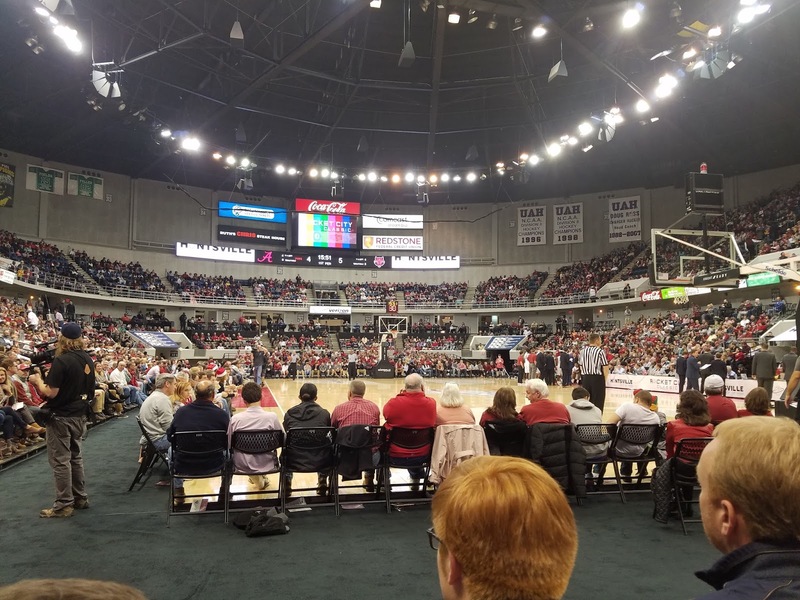 Alabama bounced back from arguably its worst performance of the season in a loss to Clemson, and had perhaps its best performance of the season in beating Arkansas State in the Rocket City Classic. With Corban Collins out with a groin injury, we went with a starting lineup of 1. Avery Jr. 2. Dazon Ingram, 3. Key 4. Riley 5. Hall. I really like the starting back court and moving Dazon to SG. Corban brings great leadership and energy but he has struggled a bit in recent weeks. I still prefer Riley coming off the bench as he is still a bit of a defensive liability, but I'm not sure there is really a better option. Perhaps Hale would give us more of his good games if he is consistently in the starting lineup? To his credit, I thought he played well coming off the bench and had good energy. In fact, the whole team played hard with a lot of enthusiasm. Arkansas State had long scoring droughts in both halves which allowed us to take control of the game. We got off to a slow start and fell behind early, but the game really turned around after the Wolves were called for a flagrant foul on Ingram. I thought we may have caught a break on that call, it was a hard foul but on replay I didn't think it looked as bad as it did in real time. ASU was playing very physical and they already had a couple of hard fouls by that point, and in that context the officials probably thought it best to try to maintain control of the game. In any event, the hard foul seemed to motivate our guys, as we shut them down for the next several minutes and out-hustled them for a number of loose balls to regain the lead. We only took a 5 point lead into the half after having a poor final minute, taking an ill advised shot way too early in the shot clock and committing a dumb foul on the other end. We finally played up to our potential defensively and put the game away fairly early in the second half, Braxton Key had another great performance with 11 points and 7 rebounds. Hall got into foul trouble and only had 5 points, but he did block 4 shots and had 4 rebounds in only 17 minutes of play. He had some monster blocks early and I think that led to him being a bit too aggressive. Most of his fouls were for jumping into air-born shooters going for the big blocks. Thankfully, Jimmie Taylor really stepped up his game. He was our leading scorer with 12 points. Ingram was also in double digits with 10, and I think moving him off ball helps him be a bit more aggressive. AJ Jr has some limitations at point, but he seems more comfortable pushing the ball up the court and isn't afraid to take some chances. Hale had a nice game with 9 points but more importantly I thought he had his best defensive effort so far on the season. My only real complaint is Davis. He made a 3 in the first half and I told Hville, "great, now he's going to be jacking it up all night." He went 0 for 5 after that, including a couple of air balls. He needs to stop throwing up wild, contested shots from all over the court. 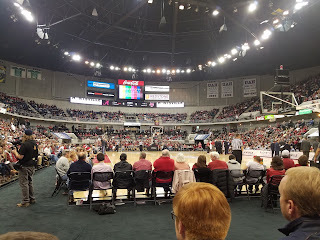 This was only my second trip to the Von Braun center and first for basketball (I watched our Birmingham Steeldogs upset the Vipers in arena football there back in the day.) They've done some renovations and the lobby and concourse area are very nice now. For a hockey arena, it is not a bad place at all to watch a basketball game. My only real complaints about the venue were they could use some more display boards to show stats, etc, and only having one main entrance/exit made it somewhat time consuming to get out after the game. Knight Eady did a great job promoting the event, and major props to our Huntsville and North Alabama fans for showing up. It was a legit, hard sell out of 6,500. I think a big part of the team's improved energy can be attributed to playing in front of a packed house. Former stars Bobby Lee Hurt and Richard Hendrix were among those in attendance. After the game Coach Johnson and the team came out to half court and acknowledged/thanked the fans. They announced it as the "First annual Rocket City Classic," and my understanding is that Knight Eady is already trying to work on setting something up for next year. Basketball is actually a big deal in that part of the state, and it's no coincidence that a number of top prospects have emerged from the Huntsville area in recent years. I hope we start playing there more often during the Christmas break. Finally, I really enjoyed hanging out with and watching the game Hville. Hopefully he will start posting here again soon. Texas tackles Tide, Longhorns 77 Bama 68.